Felizhouse Fascinator Hats Women Ladies Feather Cocktail Party Hats Bridal Headpieces Kentucky Derby Ascot Fascinator Headband (#2 Cambric Khaki) by Felizhouse at Envy This Stuff. Hurry! Limited time offer. Offer valid only while supplies last. 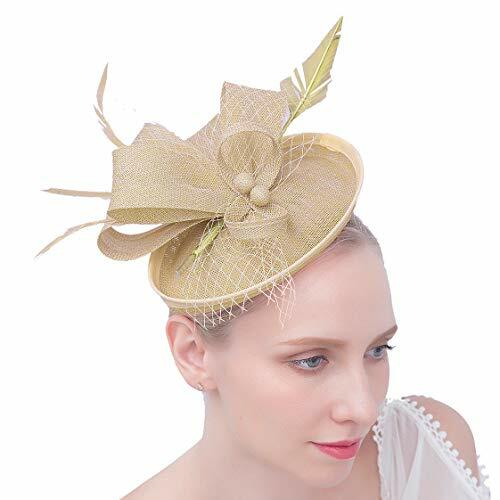 【High Quality Pillbox Hats】The wedding party headpiece is made of chosen Cambric and Feather, decorated with cute veil mesh. Our derby fascinators hats for women come with a head band and a hair clip, easy and comfortable to wear. 【Classy Party Headwear】With the unique classy and beautiful headwear design, you can choose your beloved color to match with both of your 1920s flapper vintage dress and modern fashion outfits or attire. The bow knots petals and the swing feathers will stand out your elegant and lively temperament. 【Fascinator With Gift Box】This item comes with a gift box. It will be a great gift choice for your girls or ladies, for your girlfriend on Valentine's Day, for your mom on Mother's Day. If you need to host a party, they will be wonderful party favors for your guests. 【Fancy Costume Headdress】This gorgeous hair accessory is suitable for female to attend a Horses Race, Royal Ascot, Christmas Party, Tea Party, Kentucky Derby, Wedding Bridal Shower, Church, Cocktail Party, Carnivals Performance or any other event. 【For Women Girls】Fascinator hat Hair band diameter: 12cm (Adjustable); Hair clip length: 7.5cm. This headwear is not too big nor mini, fits both teenage girls and ladies women, long hairs and short hairs. If you have any questions about this product by Felizhouse, contact us by completing and submitting the form below. If you are looking for a specif part number, please include it with your message.